Australia's economy expanded at its slowest quarterly pace for more than two years as mining and construction activity fell and exports declined, data showed. Economic growth was a tepid 0.2 percent in April to June, taking the annual rate of expansion to 2 percent. The latest figures, which follow 0.9 percent growth in the first quarter, were softer than analysts' expectations of June quarter growth of 0.4 percent for year-on-year growth of 2.2 percent. The Australian dollar, which was hovering around 70 US cents early today, briefly slipped by half a US cent to 69.95 US cents. “It's a twisted economy right now,'' the National Australia Bank senior economist David de Garis told AFP. “It is making some economic progress, but in a still-difficult environment. Mining production “fell significantly'' by 3 percent for the quarter, although growth through the year was 2.1 percent, the statistics bureau said, adding that the weaker data came as exports also fell. Net exports detracted from GDP growth by 0.6 percentage points for the three months. In positive news, household spending supported growth, lifting by 0.5 percent for the period while government expenditure jumped by 2.2 percent. 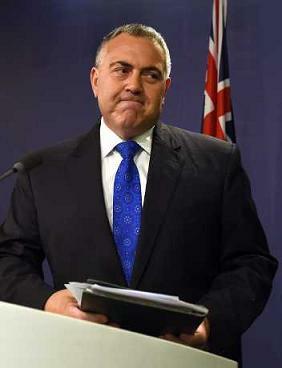 Treasurer Joe Hockey (Pictured) sought to allay fears about the economic outlook. “At a time when other commodity-based economies like Canada and Brazil are in recession, the Australian economy is continuing to grow at a rate that meets and sometimes beats our most recent budget forecast.